Watch a microrobotic fly from Wood's laboratory. Small, winged insects have a reputation for accidentally buzzing into closed windows or swooping into your eye during a bike ride. But the research of Robert Wood, assistant professor of engineering and applied sciences, may cause you to look twice at your next fly. Wood has been perfecting a robotic fly whose eventual applications might include locating survivors trapped in mines and spying in wartime. (The research is funded by the Defense Advanced Research Projects Agency, within the Department of Defense.) Now in his second year at Harvard, he began working on the project while a graduate student at the University of California, Berkeley in the late 1990s. The ambitious undertaking was, in many ways, the wrong project for Wood at the time. His interest in control theory—an engineer’s perspective on how systems work—made him eager to develop a way to manage such a device. One small problem: “If you want to control them, you’ll have to build them first,” his adviser told him. Wood, with a background in electrical engineering, would have to become a mechanical engineer. That crossover, which has lasted almost a decade, began with months of research alongside biologists to study the complex wing movements of houseflies, bees, and fruit flies to better mimic the mechanisms that give them flight. Then came the hard part. Designing an automated fly implied having the ability to make lightweight, miniature working parts, a process that Wood says took up the bulk of his doctoral study, because of the lack of any previous research on which to draw. “For years, the thrust of our work was ‘How do we do this?’” says Wood. “There was no existing fabrication paradigm, given the scale we were operating on, the speed we wanted to operate with, and things like cost, turnaround, and robustness.” His research group developed and fabricated a laser carving system that could meticulously cut, shape, and bend sheets of carbon fiber and polymer—both strong but lightweight materials—into the necessary microparts. And how to power those wings to beat 120 times per second? 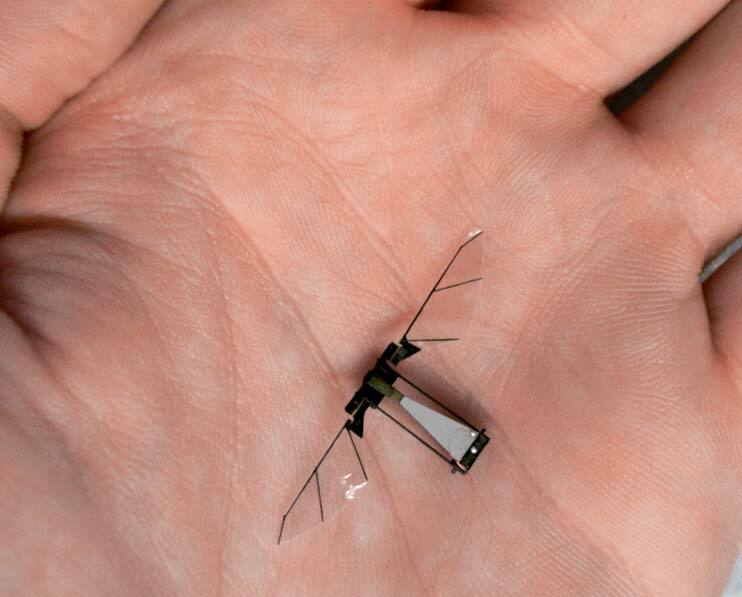 To keep this 60-milligram robot (the weight of a few grains of rice) with a 3-centimeter wingspan to a minimal size and weight, Wood says, you can’t simply use a shrunken version of the heavy DC (direct current) motors used in most robots. So he and his team settled on a simple actuator: in this case, a layered composite that bends when electricity is applied, thereby powering a micro-scale gearbox hooked up to the wings. Wood says the actuator works even better than its biological inspiration. The power density—a measure of power output as a function of mass—of a fly’s wing muscles is around 80 watts per kilogram; Wood’s wing design produces more than 400 watts per kilogram. The first takeoff occurred late one evening last March, as Wood worked alone in his office, his colleagues gone for the evening. As the fly rose, Wood jumped up in celebration, quickly verified that his camera had captured the flight, and let out a sigh of relief. Success meant that Wood could finally turn to those questions that weren’t worth asking until the fly took off: Is the shape of a fly’s wings (a less-than-optimal design which Wood improved on in his robotic version) a biological limitation, or does it somehow aid the fly’s aerodynamics? Does a four-winged insect offer a design improvement? Even questions of evolutionary biology come into play: Why did all the four-winged arthropod flyers of the late Carboniferous period evolve to have two wings? Wood figures he is still only one-third of the way toward his goal of creating an autonomous flying robot. But the next step should be at least as rewarding, considering that it will include a focus on control of the insect—the reason he first got involved in the project years ago. His fly now runs on electricity transmitted via thin wiring from high-voltage amplifiers, but he aims to add an on-board power source. Initially, he hopes for five minutes of flying time, which will be extended as the battery options improve. Eventually, he hopes to program insect robots to work in a group. “We want a human operator to be able to take out his batch of flies and say, ‘I want you guys to search for carbon dioxide’—a survivor breathing in a collapsed building,” he explains. From there, Wood sees the possibility of building group behaviors into a swarm: a means of pursuing his interest in the study of emergence, which examines how simple organisms such as ants can produce complex group structures. Watch a microrobotic fly[extra] from Wood's laboratory.